Jamar Giddings' efforts with young people at the West Mabee Boys & Girls Club isn't limited to traditional office hours or the confines of the club's building at 2143 S. Olympia Ave. The impact he's had on club members is as much from his interaction with them outside the club; at church, sporting events, and school activities. He has first-hand knowledge of the importance of one individual's impact on the life of a young person and how that involvement can result in adopting a healthy lifestyle, becoming involved in their community, and achieving academic success. 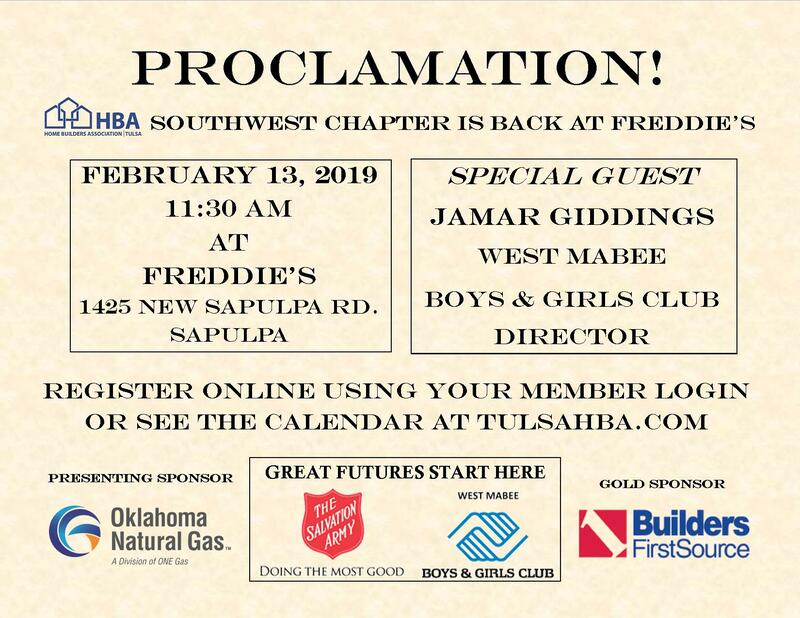 Join the members of the Southwest Chapter as they return to their old stomping grounds on Wednesday, February 14 at Freddie's in Sapulpa. There you will learn about the needs of today's youth and how HBA events and volunteers can assist in those efforts.